It’s wonderful how so many times things turn out much better than we anticipate. It must be so heartening (and a little scary too!) to see the children getting more and more independent. Glad you’re settled in your new place. Have a good April, Tulika. Oh yes. It is while it is heartening to see the children grow independent I am constantly questioning myself as I tread the line between letting them go and holding on to them. Oh we haven’t shifted yet. We will though, sometimes next week. Thank you for the reminder of the attitude of gratitude. It hasn’t been happening for me recently! Aw Alice. I know it is hard to be grateful when things aren’t going your way. Hang in there. 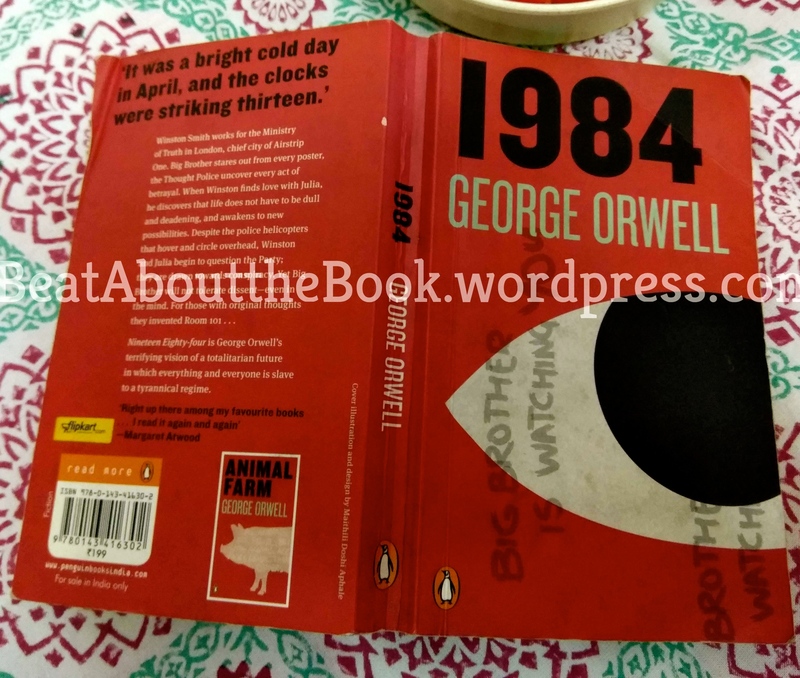 1984 was a very depressing read for me and I hoped I would never ever have to read something like that again – totally understand your dilemma at the moment via it!! You sound like such an amazing mom- so patient and understanding; your kids are super lucky to have you!! I remember getting loose motions before exams and my parents would not be very understanding about it. I guess it was the pressure to perform that was loaded down on me that made me stressful and anxious about exams. Yup 1984 is quite a read. What’s worse someone sent one of those basolutely regressive kind of forwards right then on whatsapp and that put me off even more! Sigh! I hate the way things are currently in our country. And no I’m not half as patient as I want to be. It must have been terrible to have to deal with that much anxiety. I used to be anxious too though mercifully there were no physical manifestations. Somedays I’m just glad my exam days are all over. You have a wonderful April too. Gratitude and acceptance – the perfect combination with which to face life! And the threats made me giggle – remembering how my sister and I used to fight! Looking back, I’m surprised at how my mom managed the two of us. We could be little monsters! Ha ha.. I guess we all were quite bad. I remember my sister and I used to talk so much that our mom would sit between us when we studied. Thoroughly enjoyed your post. Your post has given important insight about raising children and being thankful for the blessings they are! I’m glad the post resonated with you. Thank you for the good wishes, we need them for the shifting :-). I absolutely love this. So much joy and wisdom in this post. I think its the best thing you can do as parents…to teach them the basics and then let them be, learning, discovering and growing into their true selves. Hilarious reading H teaching his sis…‘Tell me or I’ll cut off your hair’ Bless them both! Oh it’s hard letting them be, though I’m getting there. The Indian education system is too demanding. The worth of a person, even that of a child, is decided based upon academics that freaks me out. As for H and N fooling around – yeah we do have our moments :-). I hope you have a fantastic April! It must have been hard being that stressed. I know of many children who get cramps, even fever, due to stress. So that’s something I’ve learnt to be grateful for. The trouble is that here we’re all so focussed on exams that they don’t pay any attention to the projects they have. When in fact the projects are a fab chance to learn. You must find time to read 1984. It’s depressing for sure but it is an ridiculously accurate mirror of today’s India what with the sold out media and people blinded by manufactured hate. Oh thank you Unishta. I worry all the time whether I am getting this parenting thing right. I should have linked up to my exam posts of the last few years and you’d have known how I’ve progressed. There was a time I was driven crazy with anxiety to see the children so stress-free and not bothered. So it’s with much effort that Ive reached this space and I’m glad I’m here. I’m trying not to let the grades worry me. It’s an effort though, coming from a very academic family. “There was just one day that I lost sleep and that because I was reading a rather disturbing book” !!! Seriously? What book was that yaar? I have lost sleep over only 2 books in my entire life. One was HP5, ‘coz I couldn’t put it down even to sleep. And 2nd was a Wilbur Smith. From his Egyptian series. You remember that Delhi Nirbhaya case? This book had something exactly like that! I read it just a few weeks before Nirbhaya, so went into complete shock at the inhumanity of what I’d just read. Couldn’t sleep that night. And then Nirbhaya happened. Anyway, it’s good to read how you are dealing with the kids growing up. I sometimes feel we adults worry too much, about the people we love. Don’t we? Oh and I have always loved those lines by Khalil Gibran… “Your children are not your children. They are the sons and daughters of Life’s longing for itself.” So beautiful! Yup Harry Potter has kept me awake too on many nights. The Wilbur Smith books sounds worth a read except not now. The one that I was reading is George Orwell’s 1984. Actually I’m re-reading it. The situation described in the book was so similar to what is happening around us that I got completely freaked. Some of it might have had to do with the election hype and my overactive imagination too. I get that in the light of day :-). Loved reading this post which gives interesting and profound insights. I liked this bit about acceptance of our kids capabilities. I fretted and fumed for a while but now have accepted AG’s style of studying. It wasnt easy but this acceptance has helped both of us. All the very best to H and N for their exams and to you for the move to the new house!! Thanks for the good wishes Shilpa. I remember you talking about Aryan and you were part of the process that helped me be okay with whatever grades H and N were getting. So thank you. Moms must keep sharing experiences. It really helps. A to Z is one crazy fun festival. Glad the post helped you lighten up. I’m enjoying your series on admission adventures. Good luck for the rest of the month. I was smiling throughout the read OM. A gratitude attitude does make all the difference. Isn’t it? I started taking gratitude posts seriously only since last year and I enjoy doing the gratitude roundup each month. I’ve been planning on doing it on a weekly basis in a diary of some sort but I still have to get there. How are things with you? How are the kids? Exams over and done with? Perfect combination, an attitude of gratitude and an attitude of acceptance. I have realised the more we allow of children to evolve and grow independently, the more hands on they become and so do we. We cannot force our children our thoughts, we can allow them to have their own and respect them for what and who they are. I think more often than not in the process of parenting we forget to respect those boundaries. But our children know better. Unlike us, our children were born with a mind of their own, and that’s why I feel the Khalil Gibran lines always give one a lot of courage and hope. That’s a beautiful beautiful quote. Every word is a lesson to parents. In our enthusiasm to ‘help’ them we end up squashing their spirit and foisting our own thoughts on them. I realise that the best gift I can give my children is to train them to think for themselves even if it means endless arguments. It’s hard but I’m trying to get there. Thank you Natasha for that wonderful comment and for sharing those words of Khalil Gibran.